Home \ Blog \ Pepito, fun-loving bon vivant. Rafael, our Director of Development wants to make a show about business called Company Jones or Co. Jones. I can’t wait. Among the many suggestions for topics that I’ve given him, all of which he hates I think, is this one – “Can we do a segment on Pepito, the water skiing dog that needs Lasik surgery?” I’m pretty much obsessed with Pepito. I mentioned this to Patti, my neighbor – she knew just who I was talking about. I love Pepito. I drive by him every day to work. He is so happy since he got Lasik. He never used to water-ski. Now look at him! Do you know where I can find more Pepito pictures? 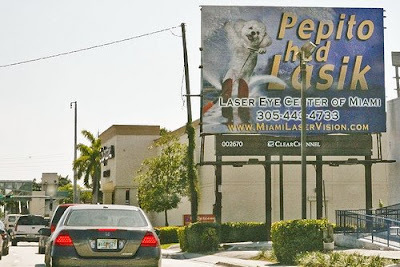 I saw another one of him in South Miami, before he had lasik. It was terrible. He had thick coke-glasses, and you could tell that he wasn’t engaging in any sort of fun beach activities. This campaign works. Talk about setting yourself apart from the field through catchy advertising. Who is Pepito, coño!